Figure 1: The increase in the number of reconstructed vertices showing an improvement in the reconstruction algorithms for the 2016 data. 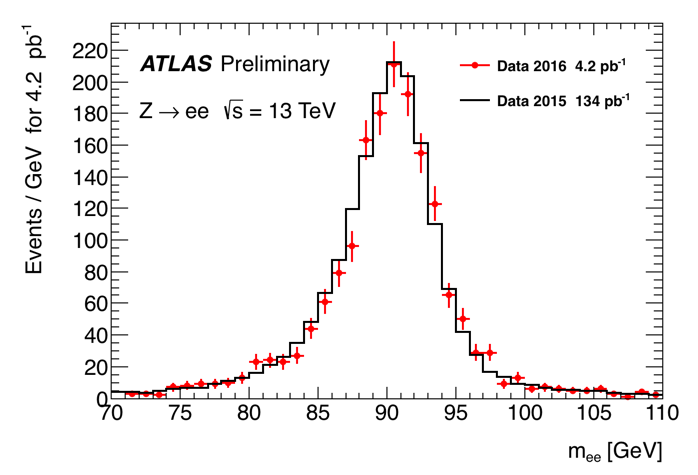 2016 is set to be an outstanding year for the ATLAS experiment and the Large Hadron Collider (LHC). We’re expecting up to 10 times more data compared to 2015, which will allow us to make precise measurements of many known physics processes and to search for new physics. Many exotic and unusual particles decay almost immediately after being produced. Therefore, what is actually measured is a set of fundamental building blocks including electrons, muons, taus and other charged particles, as well as jets (collimated sprays of hadrons), b-jets (jets containing bottom quarks) and undetected missing energy. These are all reconstructed from the information recorded in the detectors using sophisticated software algorithms. Thus the quality of our physics results depends on how accurately and efficiently we can measure these building blocks. Figure 2: The mass of the Z boson reconstructed from pairs of electrons. Good agreement is observed in the mass between the data from 2015 and 2016. 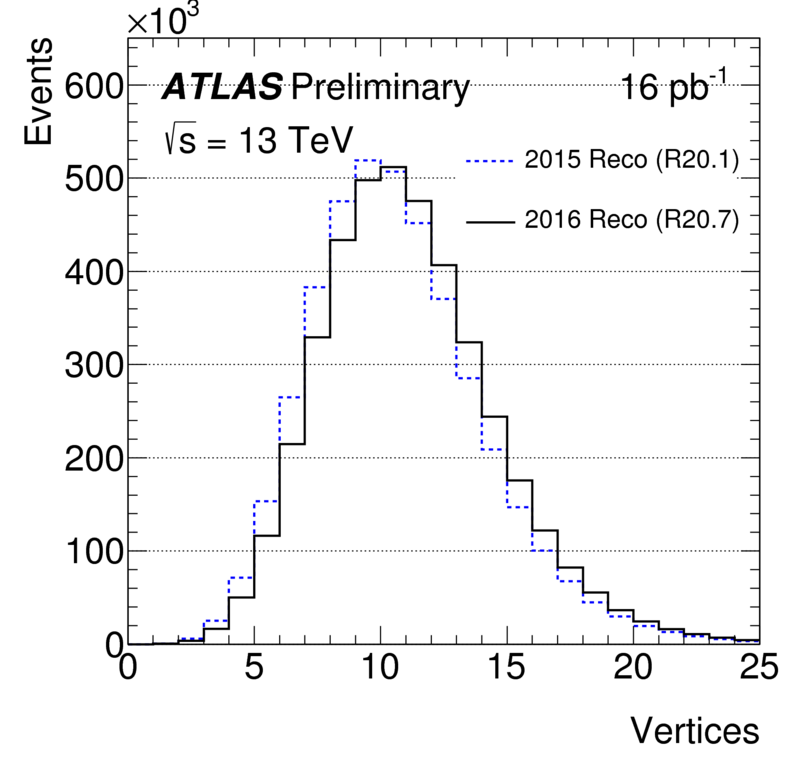 ATLAS scientists have used the recent LHC downtime to improve the performance of the reconstruction algorithms. Figure 1 shows the increase in the number of reconstructed primary vertices, due to an improvement in the reconstruction algorithm. Primary vertices are reconstructed from the charged tracks and indicate the number of interactions (or collisions) between pairs of protons. The average number of interactions in this dataset is 15. Reconstruction algorithms need to be tuned and evaluated using data. Well-known particles provide an essential component of detector calibration, using their mass as a known reference. Figure 2 shows the mass of the Z boson reconstructed from an electron and an anti-electron. Electrons are reconstructed using the energy measured in the calorimeter and the momentum of the track in the inner detector. There is good agreement between the data taken in 2015 and 2016, which demonstrates that the quality of the detector and the reconstruction algorithms is already very high. Figure 3: The b-tagging discriminant used to distinguish b-jets from jets containing charm and other light flavours. Good performance is observed with agreement within uncertainties between the data and the simulated data. 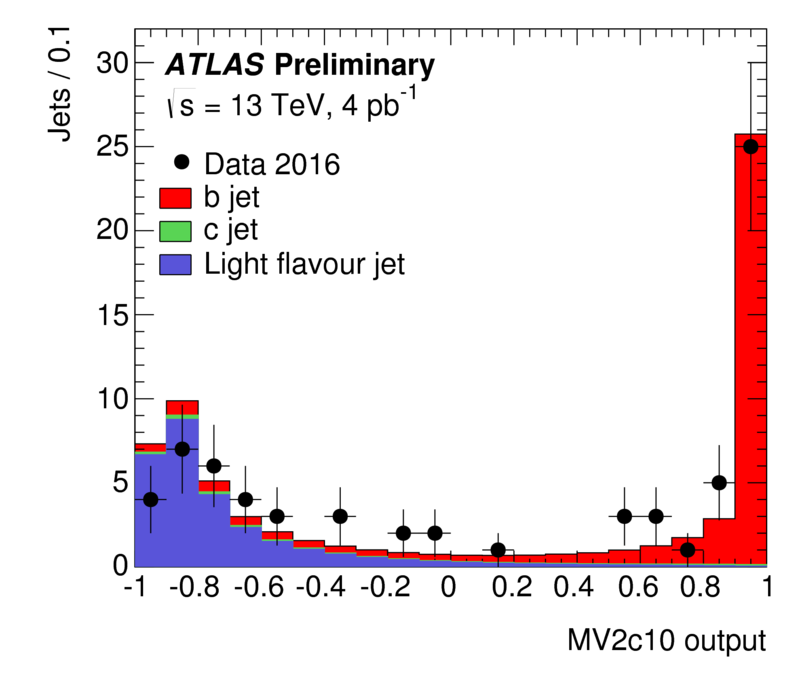 The ability to identify jets containing b-quarks is critical for identifying the signatures of specific particles such as top quarks, Higgs boson and other more exotic particles. These b-jets are reconstructed using multivariate algorithms, which exploit techniques from machine learning to identify the characteristics of b-jets compared to other jets. These algorithms are trained using simulated data, and the output is a discriminating variable with the signal having high values and the background having low values. Figure 3 shows the output of this algorithm and the components from the different flavours of jets are indicated with different colours. The signal from the b-jets is very well separated from the background, which demonstrates that the algorithm is performing with high efficiency. These excellent results from the early 2016 data show that ATLAS is performing very well. We look forward to exciting results to come!